I come from a culinary family, and there's nothing that intimidates me more than a commercial kitchen where some members of my family work. I tell you, that place is demanding and fast-paced! Their tools are top of the line. Among all the tools and cutlery, the meat cleaver is the most abused. 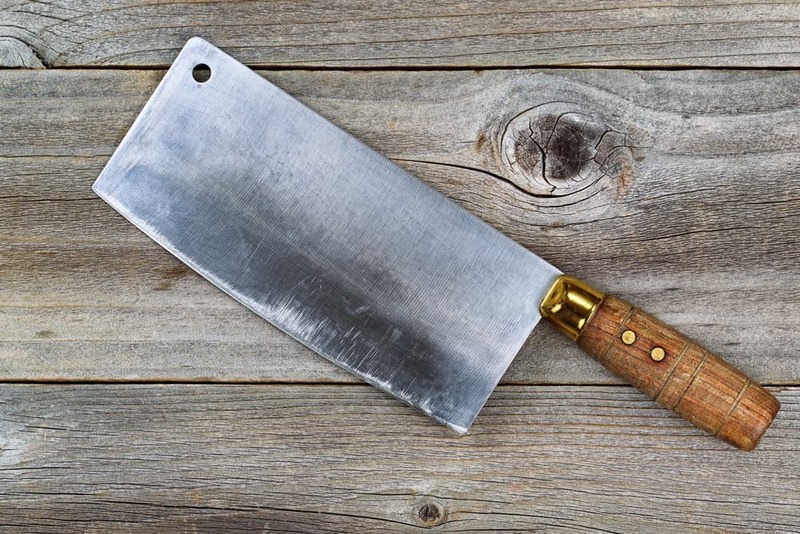 I set out to find the best meat cleaver that can withstand the demands of a commercial kitchen, but also relatively safe to use in our own kitchen. They aren't just "knives that cut meat". Trust me, they're much more than that. Why Cleavers' Blades Are Blunt? What's That Tiny Hole In A Cleaver's Blade? Why Do Cooks Need A Meat Cleaver? A meat cleaver is a rather heavy tool with a wide, slightly blunt blade that's used to chop thick meat and cut through bones. It is popularly used at butcher shops and restaurants, but is also a great tool to have for home kitchen use and for Friday barbecues. Have you tried opening lobsters with a cleaver? You'll find it's got the most ideal blade for lobsters. Curious how meat cleavers are made? Here's an excellent video to give you an idea. Watch here. A heated bar steel is shaped roughly under a drop hammer, forcing the steel to take immense pressure. When the steel blade forms a knife shape, the blade goes through a honing and grinding process to achieve the final shape and smoothest edge. Forged meat cleavers are stronger, thicker, and heavier than stamped cleavers. They have a bolster between the handle and the heel and provide better balance. Forged cleavers are usually more expensive than stamped ones, however. A flat steel sheet is cut to a desired knife blade shape by a hydraulic press. The blade blanks are then sharpened by undergoing multiple grinding steps and honing process. Stamped meat cleavers are thinner and lighter than forged cleavers. They don't have a bolster between the handle and the heel, and does not provide the same balance as the forged blades. Stamped blades are less expensive than forged ones. 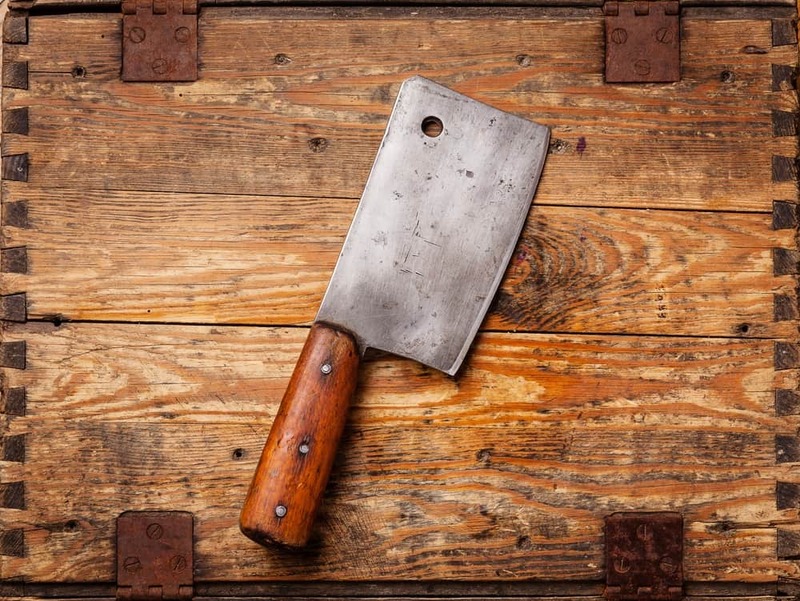 A meat cleaver's blade is usually 15 centimeters (6") long and is either made of high-carbon steel or stainless steel. You'll find some cleavers with the blade and handle constructed as one piece, and some with separate attached wood or plastic handle. Meat cleavers are the husky boys of the knife world. They're the kitchen's machete. The squared-off design offers toughness and weight to your every chop. Why would you need a meat cleaver to be heavy? Well, if you're looking to cut through bones, sinew, cartilage, and animals' thick meat, you would need a heavy blade that can do the job with just one swing, right? Here's a rule of thumb when shopping for a meat cleaver: The heavier, the better. 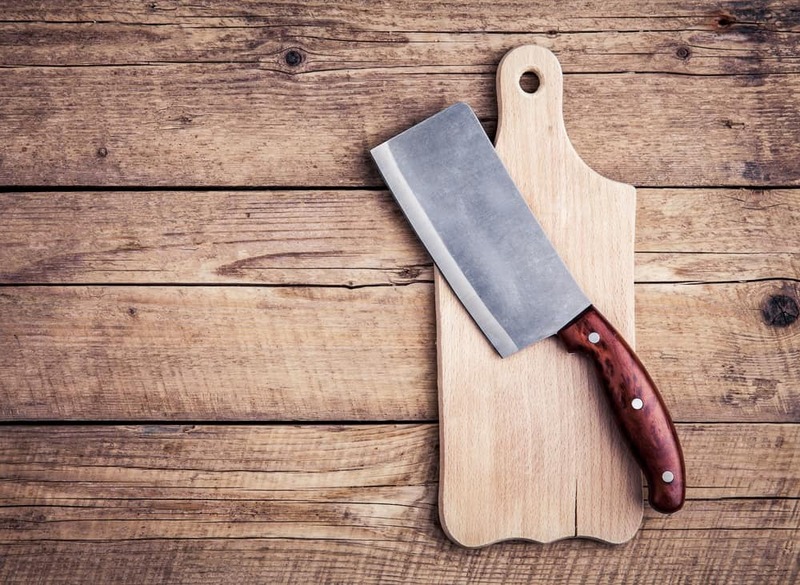 A meat cleaver is purposely designed to be slightly dull because if you get a razor-sharp blade for a cleaver, it will become brittle in no time. A somewhat blunt edge increases a blade's lifespan and capability. Cleavers rely on the user's swing and the cleaver's weight, instead of the blade's sharpness. They are designed to cut efficiently using the user's sheer momentum. That small hole is for hanging the cleaver on hooks and also on butchers' belts. Most butchers don't like leaving the cleavers lying flat on a surface as it apparently dulls the blade, plus it saves them counter space. Not only cooks need a meat cleaver. It's also a hunter's other "prized possession". Hunters use meat cleavers to chop up a carcass with no problem. As with cooking, meat cleavers are essential to cutting meat and getting the portions needed for serving. The blades in a cleaver are constructed in such a way that buckling is avoided. 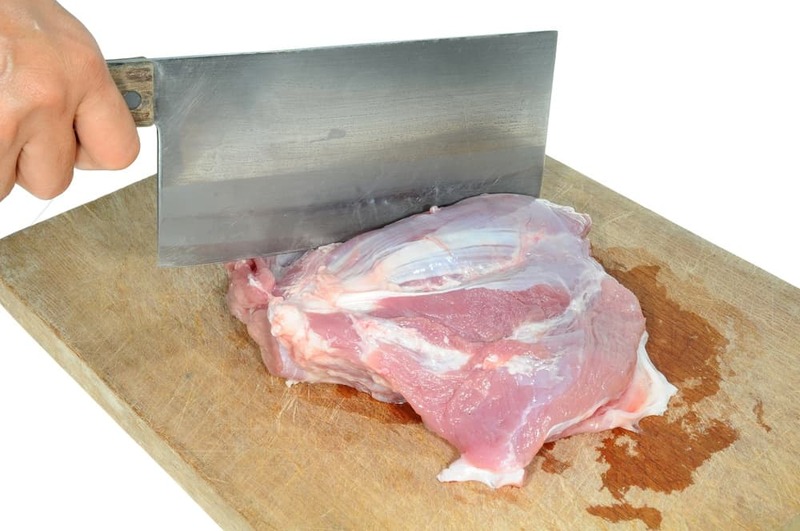 You can't chop up fresh and large meat with just your standard kitchen knife, no matter how sharp it is. If you need to cut through bones, you're going to have to invest in a good meat cleaver. Have a ﻿peek﻿ ﻿here. Did you know that using the wrong knife when chopping large meat will most likely end up in a preventable accident? Never use thin, flimsy knives for chopping! Dexter-Russel is a household name because it's earned a reputation for its craftsmanship and clever designs. They produce good knives, but they are better known for their meat cleavers. The Dexter-Russell S5288 is a destroyer. 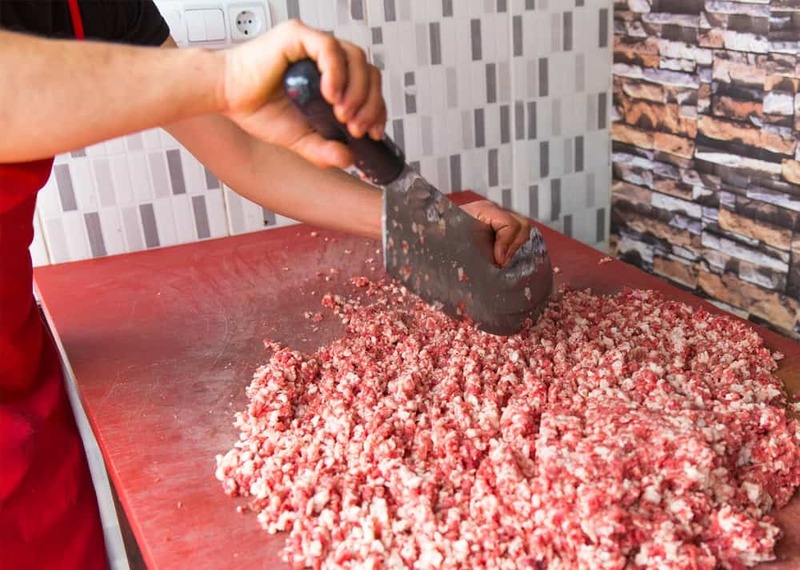 It hacks through thick meat without any problem, and it easily chops the toughest joints. What about aesthetics? Dexter-Russell is known not only for functionality, but also for design. The cleaver's handle is made of rosewood. Brass rivets hold the handle and the blade tang together, giving it a rustic yet stylish look.This meat cleaver weighs 2.5 pounds and is proudly made in the USA. Utopia Kitchen's 7-inch meat cleaver provides accuracy in trimming and segmenting larger meat cuts and large fruits. The stainless steel blade is easy to use and is rust-resistant. It is built and designed for commercial kitchens and can withstand heavy use. This cleaver is perfect for users with arthritic hands and those experiencing wrist tension because the handle is ergonomically designed. The cleaver also has a heavy feel, providing better balance during swings. You'll find a hole at the top corner of the blade for hanging and to save you counter space.This meat cleaver weighs 1.1 pounds and is dishwasher-safe. 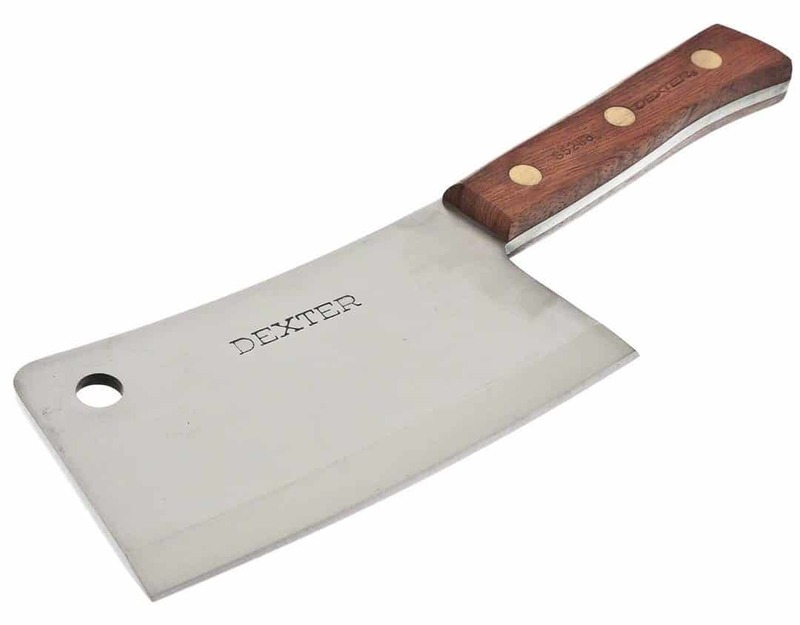 While this cleaver claims to be "traditional", the design was thanks to Dexter-Russel. This meat cleaver features a high carbon steel blade and is also perfect for cutting vegetables. The blade is ground and honed manually and is offered in either stainless or the classic. With its thick spine, it makes heavier chops and users get a sturdier feel.In keeping with the traditional design, the 3-inch handle comes in walnut wood which goes perfectly with any kitchen; and offers a non-slip grip.The Traditional S5198 is the best-selling Chinese chef's knife from Dexter-Russel. This meat cleaver weighs 10.4 ounces. The J.A. 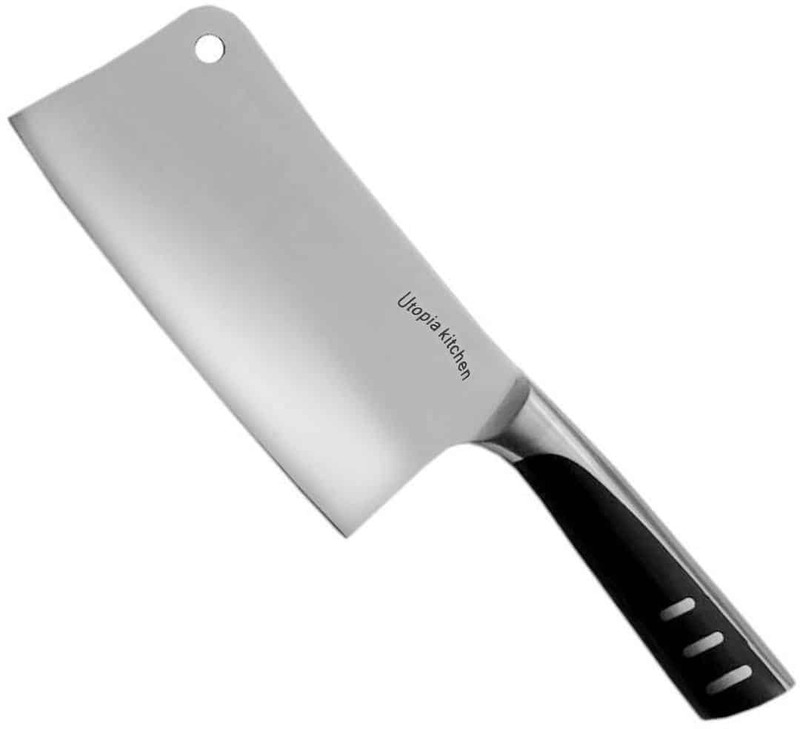 Henckels International Classic is a 6-inch stubby cleaver that's built more for home use than for restaurants. It's a workman's brand, yet surprisingly affordable. Is it heavy the way it should be? Yes. You'll find the hole in the top corner useful for hanging the cleaver on a peg or hook. This meat cleaver has handles that are shallower than other brands, so it's perfect for users with small hands. We recommend washing this cleaver with hands, instead of in dishwasher, although it is dishwasher-safe.The meat cleaver weighs 1 pound. The J.A. Henckels International Classic is made in Spain and offers a lifetime warranty. The Global G-12 meat cleaver is easy on the eyes for those who prefer the more industrial look. With a wood-free design on the handle, it used to cause grip problems for some people. Thankfully, Global has fixed that and came up with a more ergonomic metal handle design. The full-tang construction is smart and showcased exceptional craftsmanship. The blade is stamped by hand at a 15-degree angle. The G-12 cleaver is relatively smaller than the others in its category. It's perfect for users with smaller hands. 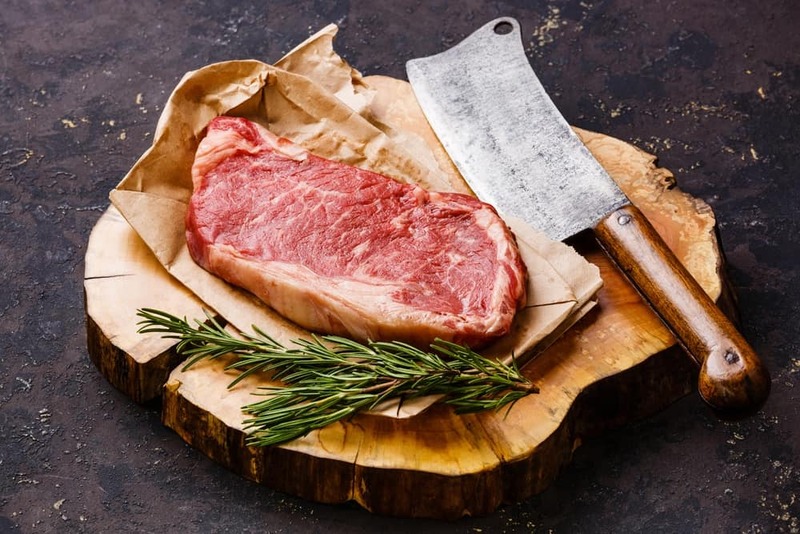 By keeping the weight slightly low and with its ergonomic design, users with arthritic hands can now comfortably use a meat cleaver.This meat cleaver weighs 1.3 pounds. Considering price, construction, functionality, reputation, and design, the Dexter-Russell S5288 came out as the winner in our books. The hefty blade is the highlight, with its high-carbon steel material and a full tang that's fastened securely to the cleaver's wood handle. The handle is triple riveted! What does that mean to you? Rivets give you the heft and the strength you need for effective hacking. What about the price? You'll be surprised to know this meat cleaver is under $50. Why is it perfect for us? It's our declared winner because the Dexter-Russell not only captures our design requirements, but also because we've seen a good number of high-end restaurant chefs use it. Did you find your own meat cleaver on the list? If not, we hope we were able to give you a good idea of what the best meat cleaver is in the market today. If you have related stories to tell or if you want a personal review of the products above, please feel free to be heard in the comments below! Oh, and we don't mind if you share the article on Facebook!